A pivotal time. 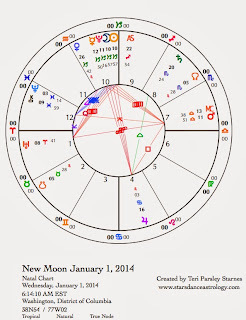 The New Moon of January 1 begins a dynamic and intense lunar cycle. This lunation is powerful not simply because it falls on the first day of a new year. 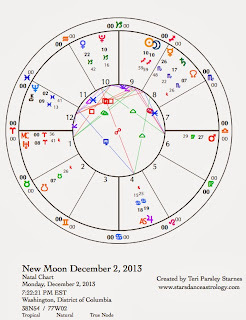 This New Moon also rings a bell that awakens a new stage in our evolution. Uranus and Pluto are the harbingers of this change. These two planets of cultural transformation have been moving in and out of an exact square aspect since 2012. This waxing square phase of the Uranus/Pluto cycle lasts for another year. It is unusual to have two planets take so long to move out of sync with each other. It is as if we are in labor and we’ve been experiencing the slow build of contractions. In April, this transit reaches a new peak with Mars and Jupiter and a couple of eclipses playing big roles in moving things along. This lunar cycle is a preview of more excitement this spring. A challenge, a hope. We are poised to go to new levels of self-awareness, accountability, power, and transformation. The arenas for these changes are broad. From global arenas like politics, the environment, the economy, and international relations—to the personal arenas of love, home, work, and identity—everything is up for deep investigation and rapid transformation this month and through the year. Every realm has potent significance. A new heroic vision. With core issues being affected, this coming lunar cycle and transformational spring season call for a new response. Our notion of heroism must shift. The old image of the rugged individual fighting alone, encased in armor, and discounting the costs of battle no longer serves. A new vision is coming forward to meet the challenges of change, and is part of the transformation underway. This new vision requires communities to support individuals. The new vision is community as hero. There are pitfalls. We’ve inherited very real shadows from past experiences of group mind. The challenge will be to look clearly at these shadows of exclusion and conformity, while at the same time rejecting the idea that we must remain separate and alone as we go forward. A belief in transformation. It is human nature to fear change even when we know that change can also bring hope. It is also natural for fear to ebb and flow. Sometimes it can feel paralyzing and sometimes fade to a mere blip on the screen of our perceptions. The task is not to judge this response but to remember there is more going on. The current positions of Pluto and Saturn are inviting us to take transformation seriously. At times this will mean we will be afraid. But both of these planets offer us things that are more precious than security. Saturn offers the authority to manifest. Pluto offers rebirth after death. In the dark times, a belief in the power of transformation gives us reason to continue. The bones of intention. This next New Moon occurs in the sign of Capricorn. At each New Moon, we begin a new cycle of dreaming and practicing mindful intention. As we pause at the beginning of a new year and new lunar cycle, what do we wish to invoke from the sign of the goat fish? Capricorn and Saturn, the ruler of Capricorn, rule the bones. Capricorn provides the skeleton for our intentions. This sign insists that we start with the basics, the foundations, in order to ascend to success. With Venus moving retrograde through Capricorn, we are called to remediate, to move back to those foundations and take a good look at the bones that will support transformation and growth. We develop trust in our knowing when each of us can name what that is. I ask you to join me in the journey into the bones of self and possibility as we follow the Moon through the Capricorn cycle. Sunday, December 29. Does it feel like a long time since we began the Sagittarius lunar cycle on December 2? The exuberance of Sagittarius led us into the deepening and wondrous dark of late fall. Now, at the very end of this cycle, the Moon returns to Sagittarius with a question for you: What did you discover? Every lunar cycle is about discovery, but the Sagittarius cycle is even more so about the quest for knowledge and truth, with lots of fun thrown in. The mutable fire sign offers a torch to light the way through times of doubt. Remember that flame. The Sun and Mercury come together to spark conversation, realization, and a hidden desire to understand our essential natures. The square of both the Sun and Mercury to Uranus make these things even more daring and potentially explosive. Sometimes, the biggest change we can make is to change our minds—not someone else’s mind—but our own. Notice the freedom this can bring. Monday, December 30. Quite likely, sometime today, you will be challenged to choose between conflict and resolution. Mars in Libra squares Pluto in Capricorn—a tense aspect at any time—is more significant this time because Mars is making this aspect to Pluto again after it turns retrograde on March 1. This is one of the transformative planetary exchanges that will occur at the New Moon and this spring when it will be stronger. (See the introduction to this week’s forecast for more about this.) Pluto in Capricorn wears the clothes of oppressive authority. Mars in Libra just wants fairness and equality; is that too much to ask? What if there are no bad guys in the solar system? How do we embrace powerful forces of responsibility with equanimity that doesn’t just roll over and acquiesce? Notice how you react. Tuesday, December 31. New Year’s Eve. Not every thought and feeling we have is pretty or a source of pride. There, I said it. None of us are perfect. Today, Mercury joins Pluto and if we are brave enough, we get illuminating perspective on our imperfections that can actually lead to empowerment. What do you need to say? What are you not saying? And why? Sometimes the enlightenment doesn’t come from saying what hides in our hearts but in being able to actually look at what hides in our hearts without judgment. Mercury also squares Mars today increasing the likelihood that we will say something impulsively. Others are having the same trouble with their tongues too. The good news is that there is power in words; perhaps as a way to honor the cusp of a new year, you can set aside time to unleash words that will create the world anew. 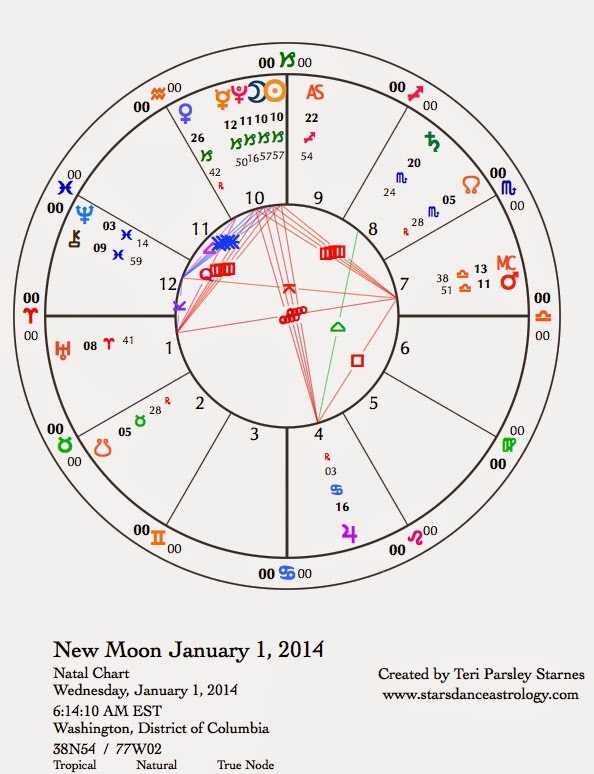 January 1, 2014—New Moon: Dreaming. New Year’s Day. See the introduction to this week’s forecast for more context about this important lunar cycle. 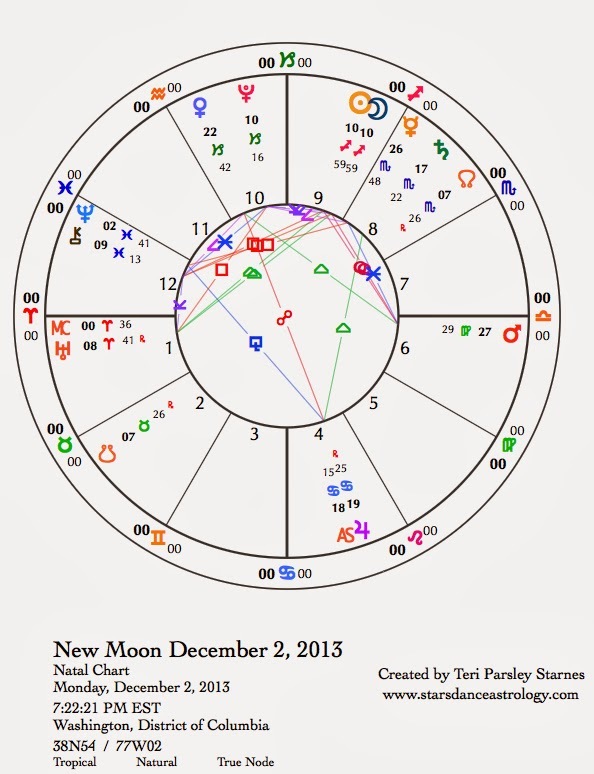 I used a metaphor, describing the transits of this New Moon as a bell ringing in a year of transformation. We are ringing in a new year and most likely a new paradigm too. Goodness knows, some things have got to change. The Sun, Moon, Pluto and Mercury are closely conjunct in Capricorn. There’s a lot of energy here to get to the core of what we want to manifest this cycle. Capricorn invites us to look at the bones of our vision for the future. There’s a lot of support for taking ourselves seriously. The stakes feel high and we can use the forward momentum of a new lunation and a new year to set strong intention. This line-up of planets in Capricorn is challenged by Mars in Libra and Uranus in Aries. This is not the signature of patience. Passion can help us get to the bones of what really matters and to let go of the externals that aren’t important. Whatever we can do to discharge stress or impulsivity will be helpful. This is not a time to squelch our feelings, but neither is it a time to act unconsciously. Remember the community as hero that I wrote about earlier. We can help each other. Sometimes it isn’t even necessary to know how we are helping. The important thing is to know that we matter to each other in ways that are not always visible. Jupiter in Cancer opposes the Capricorn planets and Mars, and there is a wide-orb square to Uranus too. This configuration of planets in the Cardinal signs will repeat with more force this spring when the aspects are more exact. The Cardinal signs rule the core areas of life: identity, home, relationship, and profession. It might feel like nothing is safe from upheaval. Personal practices that bring you to a calm center are very helpful. Taking action, even if it is symbolic, is also a way to greet these energies with vitality. If you aren’t certain about the direction you need to go, send out a plea to your allies for help. It may take several months before you really know. It should be noted that Venus disappears from the visible sky by today. Venus is moving retrograde in Capricorn until January 31. Venus will appear again around the 20th of January as the Morning Star but still moving retrograde. During this time, we reflect on whether our relationships are serving our life plans. Capricorn means business and we want to make sure our partners align with important goals. Thursday, January 2. Did you feel the earth move yesterday? It was a powerful day, followed by another powerful one today. The Sun squares Mars. A square is an challenging exchange between the planets involved. Both the Sun and Mars feed a sense of purpose and vitality. When they challenge each other, that energy is off kilter. Perhaps we are trying too hard, or perhaps we reach a roadblock that makes us snap. Perhaps we need to learn to stand up for ourselves without blowing everyone else away. A needed adjustment between ego and will can be made today. The Moon in Aquarius feeds the energy to bring a different approach. Friday, January 3. Mercury opposes Jupiter in the middle of the night, which may have disturbed your sleep. Are you waking up in a cranky mood? Resist the impulse to make matters worse by saying something you might regret later. In spite of this, you can improve communications today. Perhaps compassion comes when we realize that everyone else is in the same boat. A nap may be in order. January 4—Crescent Moon: Beginning. The first few days of this year have not been very quiet. Even if nothing much looks different on the surface, a lot has been going on underneath. You may want to exhale today. Winter is a time to get in touch with our absolutes, which I am framing as the bones of my intention. At the Crescent phase of the Moon, we announce to the multiverse what we want. I recommend doing this out loud. When we tell the world what we want, the world is able to respond with gifts and challenges to help us manifest that intention. There are no short cuts on this journey, however an amazing amount of time can be saved when we get behind our own visions by proclaiming them clearly. The Moon in Pisces invites us to come at this intention from another direction. Intuition and dreams play a big role. Don’t be surprised if your heart feels bigger and maybe more fragile as you dare to speak your heart’s desire. … a night that seems like a lifetime when you’re waiting for the Sun. So why not sing to the nighttime and the burning stars up above? Maybe peace hides in a storm. Maybe winter’s heart is warm. in the longest night of the year. This week, for those of us in the Northern Hemisphere, we experience the longest night of the year—the Winter Solstice. That is the moment the Sun moves out of Sagittarius and into Capricorn. We leave behind the expansive and questing fire to enter the cave of long sleep and deep dreams. So much of this season seems to tell us to slow down, but paradoxically, Capricorn is probably one of the most industrious and hard working of all signs. As a Cardinal earth sign, Capricorn does not usually respond to the dark by doing less. This sign wants a plan for getting through the lean times. This sign wants to identify the absolutes. This sign means business. So, even when our bodies may be telling us to rest, our instincts are telling us to plan and work. The tension between the two poles of desire can be difficult but also filled with lasting satisfaction, not to mention ensuring our survival through the cold. Finding our own sense of balance in this season is the gift we give ourselves. Perhaps paradox lives in winter most of all. The song I quoted above has been part of my soundtrack as the days shorten. I think there may be a core of wisdom in this song that pertains especially to what I need this winter. The transits for the remainder of this lunar cycle could very well illicit intense experiences of storm, cold, and darkness. Perhaps these times will be when I need to remember that peace, warmth, and light are hiding here too. Mars, Uranus, and Pluto provide the drama through the rest of this cycle. Indeed, these three, with the addition of Jupiter next year, will continue to create a drive toward change and transformation in our world that peaks in April. Most likely this will be a tumultuous time. In preparation, it is good to ask ourselves now, how we find peace in the storm and light in the darkness. Our choices make a difference, not only in our own lives, but to the whole as well. A tantalizing guide into the heart of this winter will be Venus in Capricorn. Venus turns retrograde on Solstice. Does she hold the key to paradox in this season? If so, we need to pay attention to relationship, values, self-love, and beauty to give us insight. Sunday, December 15. If you are noticing huge waves of inspiration, a restless urge to change, or frustration at conventionality, you are picking up on the Uranus station. [A planet is said to station when it slows down to change apparent motion, either retrograde or direct.] When planets station, their influence is stronger. Uranus will station direct on the Full Moon in a couple of days but we feel this mental energy strongly now with the Moon in Gemini. Monday, December 16. With the Moon in Gemini opposing Mercury in Sagittarius and Mercury forming a quincunx to Jupiter, it will be easy to have our thoughts get ahead of themselves today. It is fun to exchange witty remarks, make surprising new connections, or to get lost in a book, movie, or hobby. Enjoy the fresh approach that a Gemini Moon brings, just be aware that flow can sometimes disguise a missed connection or make it too easy to say the wrong thing unintentionally. However, we often overlook the importance of fun and flow in our lives. This is a good day to cultivate that quality, with just a bit of caution thrown in too. 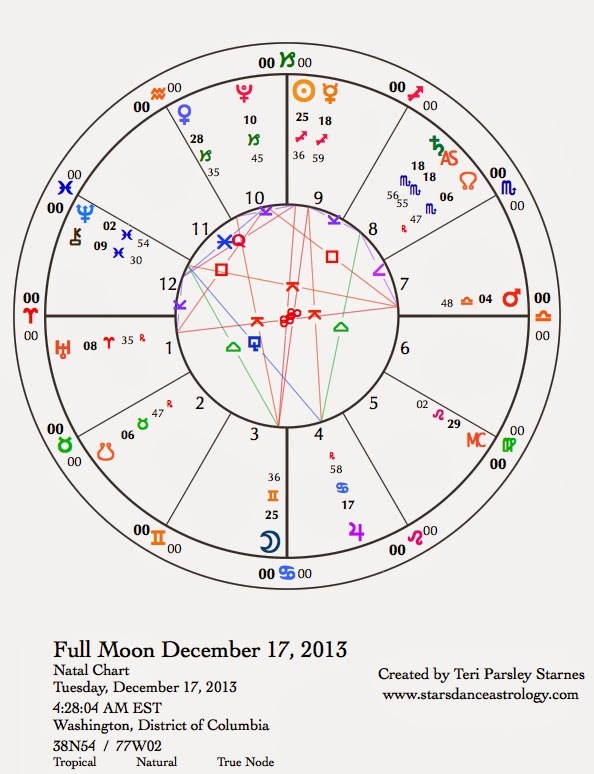 December 17—Full Moon: Illuminating. The last two days have felt like the Full Moon even though technically the Full Moon doesn’t happen until early this morning. The Moon in Gemini has been reflecting back onto the Sagittarius Sun giving us an illuminating perspective on things begun at the New Moon* The energy is about to shift and it’s a good idea to take this moment to notice what you have been learning. It might come in handy later. I like to think of the differences between Sagittarius and Gemini as macrocosm meeting microcosm. Through the small perspective Gemini achieves the same thing that Sagittarius does through its big perspective. It is all about learning and sharing what we are learning in these big and small ways. Both signs are nimble and expansive. Both are optimistic. This hopefulness prepares us for the winter season ahead. If there is any fault to be found in either Gemini or Sagittarius, it is that they sometimes are so busy with the next thing, details can be overlooked. It is easy to leave the serious work to more pragmatic signs. But now is not the time to critique Sag or Gemini. Now, we need to affirm the quest for knowledge and the joy of discovery. Yes, the starry night sky is filled with wonder and we are blessed to gaze upon it. Is it possible to fold that emotion into a small packet and put it in our pockets for a rainy day? I hope so. I want to remember this. Over the next two weeks the energy shifts. For one, the Sun will move into Capricorn with its emphasis on hard work and accountability leading us to respond in our own ways to long-term realities. For another, today Uranus stations direct releasing pent up frustrations about change. Mars in Libra will be opposing feisty Uranus on Christmas Day. We’ll need to look for peace amidst the storm during this transit. On the Winter Solstice, Venus in Capricorn will station, moving retrograde until January 31. This transit of Venus has the potential to bring us into the powerful and beautiful center of winter. We will want our relationships and our values to be blessed by this journey. At the end of December, Mars squares Pluto. We are about to get a lesson in authentic conflict. This is an opportunity to practice generosity as well as truth-telling. Thinking of what could be ahead, how will you bring the joy of this Full Moon into your heart? What does this illuminate in you? Wednesday, December 18. I admire people who can acknowledge their fears without letting those fears tell the whole story of who they are. There is courage in this authenticity. We get to aspire to that type of strength today. What helps you to remember a bigger story? Our homes and families may play a big role in helping us remember who we are today and what we really want for the world. We are not alone, even when we are afraid. And when we embrace that larger story, we strengthen others. Thursday, December 19. Yesterday’s mood was a little tense. Try to spend some restorative time at home tonight. Home and hearth become very important in the darkening days of winter. Gratitude for our hearths and reaching out to those who do not have a welcoming hearth is a wonderful way to honor this day. Friday, December 20. The upbeat Leo Moon arrives on the scene just in time for the weekend. We feel like letting off steam, dressing up in something sparkly, and kindling the warm fire of social interaction. We’ve almost reached the longest night of the year. Where do you find the spark of light within that darkness? Creativity is another way to access the light. Enjoy. 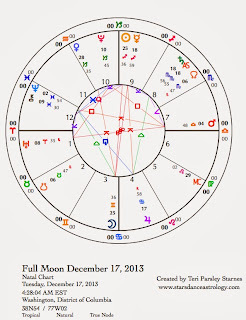 December 21—Disseminating Moon: Sharing. Winter Solstice. Whatever light you’ve discovered in this lunar cycle dedicated to self-knowledge, commit yourself to sharing just a bit of that flame with another today. This phase of the Moon encourages sharing the merit, the journey, the understanding we’ve received. On the longest night of the year, each of us has a spark to share. Venus stations retrograde in Capricorn today. Venus will station direct on January 31 and then will move back over the same area of Capricorn until early March. During this period, Venus will rapidly descend from high in the western sky at sunset. Venus will disappear from the sky around New Year’s Day. This is the short disappearance however, and we will be able to see Venus as the Morning Star near the end of January. The change in direction and disappearance of Venus has been mythologized by many cultures. The Sumerians told a story of Inanna leaving her heavenly throne to visit her sister Ereshkigal in the underworld. We can frame this journey in similar ways if we choose. Do you hear a call? Is there a reversal that you need to make in your life? What needs to be reinvigorated by a visit with your dark sister? What is your soul telling you about this winter season? How will you honor this journey within? The Moon in Leo encourages celebration as well as serious reflection since it squares Saturn in Scorpio today too. May you find peace, warmth and light in this season of paradox and wonder. see through my dense and transparent center. There is nothing like looking up into a night sky full of stars on a cold winter night to infuse my soul with expansive wonder and possibility. My heart leaps. I soar. This is the felt sensation I most associate with Sagittarius—the desire to move outward, to quest for truth, and to embrace with joy the wonder of the world. The darkness of this season allows for the sparkle of starlight to show us something new in ourselves. This lunar cycle*, I am holding an intention to see with new eyes the picture of who I am. As a fire sign, Sagittarius reminds us that each self is a generator of energy and creativity. Through the fire signs we have the opportunity to discover a healthy way to value ourselves and recognize our impact. Fire is an essential element to life and there is an essential need to know the self in order to support the whole of life. Looking at the small sparkle of stars in a vast darkness of space, we see a picture of each individual’s significance. Sadly, this is not often how we honor every individual—not ourselves, not those who are on the fringes. If fire engenders love, where does love begin? The poem above invokes another aspect to seeing ourselves anew. We are constantly being transformed like stars that are born, die, and are born again. We are star stuff, both darkly dense and opalescent. Simultaneously cold and hot, bright and dim—this season of stars invites us to become aware of paradox. We are mere specks in space and we are essential lights. The week’s transits may increase a sense of paradox, thus bringing us closer to truth. A quincunx aspect between the Sun in Sagittarius and Jupiter (the ruling planet of Sagittarius) in Cancer invokes dueling desires to hit the high road of adventure and snuggle deeply into our nests. The liberating thing about paradox is that if we are able to see beyond good and bad, we open new doorways to the possible. New possibilities hover around the themes of freedom and commitment. Another paradoxical aspect forms between Mars in Libra and Neptune in Pisces. This doorway opens up new possibilities in relationship around conflict and connection. In the midst of stretching between poles, a trine between Jupiter and Saturn anchors us in hope and reality. Where does this point you in your journey of self-seeing? Sunday, December 8. Shorter days and longer nights (here in the Northern Hemisphere) invite us to dream more. The Moon in dreamy Pisces adds to that impetus. Today, the Moon conjoins Neptune, the co-ruler of Pisces encouraging even more drifting and dreaming. As the Moon is now waxing in brightness, notice the expansive desire to travel through mystical, spiritual, or fantastical realms. Think of this impulse as a mirror of your Self. What do you see reflected? Rational communication may be fuzzy today. Better to use an intuitive, receptive approach. December 9—First Quarter Moon: Manifesting. As the Moon and Sun form a square in mutable signs today, we notice the ways that water and fire interact with each other and how this interaction affects our lunar intentions. The Moon in watery Pisces and the Sun in firey Sagittarius have a lot in common concerning the quest for truth. All mutable signs are seeking resolution, understanding, and wisdom. However, each of the four mutable signs is influenced by their unique elemental nature, which offers different approaches to similar ends. We notice the tension between these approaches. We may experience frustration as we encounter other ways to access wisdom. Conflict reveals a lot about ourselves. Notice your patterns around conflict. Especially with Mars now in Libra, we will be reminded often of the need to balance between expressions of anger and conciliation. Too much of either will get us nowhere. If we adapt a mutable approach, able to adjust our positions, we learn through trial and error to honor both self and others. However, not all is discordant today. There is a Grand Water trine aspect pattern between the Moon in Pisces, Jupiter in Cancer, and Saturn in Scorpio. Water signs encourage empathy and compassion. Watch out for victimization or caretaking. If either or both show up, how can you make room for the authentic desire underneath? Knowing what that desire is will help us to make adjustments through the rest of the month. Tuesday, December 10. In spite of a dreamy time yesterday, you may be starting the day with a deficit of sleep anyway. The morning starts speedy and doesn’t let up. Try not to over-caffeinate to get going. Better to increase your movement, maybe through exercise, when your energy sags. Activity could help even out the potentially disruptive events of the day and help you harness the high level of creativity that also will be present. The first of the week’s quincunx aspects gives an unpredictable quality to events. On one hand, we feel like spreading our wings to range far and wide, and on the other we just want to snuggle into a cozy nest. Restless energy is pulling at the edges of our awareness. Don’t fight it, but don’t be surprised if it isn’t always comfortable either. Wednesday, December 11. If fire signs drive us to better self-knowledge, we should be learning a lot about ourselves today. The Aries Moon confronts Pluto and Jupiter through square aspects. The learning style of an Aries Moon sometimes looks like getting into trouble and then finding a way to back out of it. The extraction process can feel clunky, but it reveals a lot about who we are and forces us to reinvent ourselves from time to time. How do you feel about your mistakes? Pluto gets under the surface. Jupiter makes it seem so much bigger. The trine between the Sun and the Moon gives us optimism, however. We believe we can come through our challenges with energy to spare. A phoenix rising from the ashes comes to mind. Thursday, December 12. Both Saturn and Jupiter are in water signs right now. Back in July, these two planets were trine to each other from these signs for the first time. Today, due to Jupiter’s current retrograde status, they are in trine again. [The third and final trine will happen in May 2014.] These two planets hold energy that is often understood as oppositional. Saturn is constricting and Jupiter is expansive. We get to leave behind the notion that responsibility is burdensome and adventure is escapism. Let yourself weave a new story about following your dreams. The soul journey is highly productive right now. With the Moon in Taurus we are encouraged to find the stability that hides within the journey. It isn’t a cop out to seek security. December 13—Gibbous Moon: Perfecting. The quest for greater self-knowledge is a bit like learning to spin fire. There is a certain amount of risk-taking inherent to the journey, but if we are respectful of fire and practice good safety measures, the flame is free to dance. Like juggling, like any balancing act, fire skills take focus. This phase of the Moon is about that kind of tension. We understand that discernment plays a huge role in attaining our hearts’ desires. The energetic baseline today is provided by the Moon in earthy Taurus. Earth gives fire a container and fuel for burning. Honor your containers and resources for self-discovery and expression. Mars in Libra is quincunx Neptune in Pisces—this is the second paradox aspect of the week. We’ll need to test our assumptions about how to achieve harmony and connection to others. Sometimes conflict helps to clear the way to deeper relationship, but only if we hold a value of working through it. The heart is a good guide. Fire gets us moving, even when we don’t know where we are going. What if your life were a jigsaw puzzle whose pieces were scattered over a table? What if each piece represented a day in your life, and there was no photo on the box to guide you; how would you begin to put this puzzle together and what patterns would emerge as you sorted and tested each piece to find the right connections? What would you learn about yourself as the larger picture emerged before your eyes? Puzzles are everywhere and the shifting astrological season creates a desire to solve them. We’re about to begin a new lunar cycle, infused by the dream of Sagittarius. This dream is inspired by the big picture and a quest to understand it. We see the constellation of the Sagittarian centaur pointing his arrow at the center of our galaxy—a symbol for core truth and, because there is a black hole there, a symbol also of vastness and mystery. There’s no quest too distant or too impossible for this sign. Other signs have quests. Capricorn must climb mountains to seek tangible success. The Sagittarian journey is about something hard to pin down—knowledge. Sagittarius wants to know more. Because Sagittarius is a mutable fire sign, truth is understood in a fiery way—instinctually and energetically. The equation could be thought of like this: movement plus distance equals truth. As long as we keep that equation in mind and give ourselves over to the adventure, we feel as if we are making progress. Although it may be impossible to really see the complete picture of our lives, as long as we keep moving and believing, the flame of truth will enlighten us. We will know more than we knew before. After a month of embracing the dark in last month’s Scorpio lunar cycle, I am ready for Sagittarian illumination. I am ready to see the big picture and take a leap into the next step to get that vantage point. The new lunar cycle, which begins with the New Moon on December 2, carries us through the holiday season and ends on News Year’s Eve. Any quest for knowledge we undertake will be impacted by many things, including our cultural expectations of this season as well as the starsdance of the planets. There is a mixture of old and new dance steps to consider. The old: Saturn remains in Scorpio—inviting soul-searching self-honesty. Uranus in Aries and Pluto in Capricorn are still in close square aspect—continuing the reorganization of paradigms. Jupiter in Cancer has just turned retrograde and will inflate cardinal sign conflicts over the next five months especially as it relates to needing security. The new: Venus in Capricorn and Mars in Libra step into the spotlight to elevate the role of relationship and ambition in our ongoing quest for self-knowledge. Venus will station retrograde in Capricorn on December 21. Balance, relationship, values, and self-worth are important themes of this transit. We have a longer time to focus on these issues through the Capricorn lens—hard working, ambitious, and possessing an innate understanding of mastery. We notice our own high expectations. Mars enters Libra the first week of December. In March, Mars will stage its own retrograde journey through this sign of balance, justice, and relationship. Do you see a theme here? Partnerships of all kinds, even those that are openly unfriendly, rise to the top of the list of what matters most to us. Retrogrades give us time to reflect and go deeper. Mars is about our passions. Even in the peace-loving sign of Libra, Mars answers to desire. This will impact how we relate. If mastery and desire had a conversation about balance, what would be discussed? On Christmas, Mars enflames our passions to be authentic through an opposition to Uranus. On December 30th, near the end of this lunar cycle, Mars forms a square to Pluto in Capricorn—time to be honest about the passions driving our lives and to bring this honesty to relationship in a healthy way. What insightful intention will you hold for this cycle? Sagittarius offers illumination. I invite you to join me in seeing with new eyes the picture of who you are. I don’t know what gifts/challenges this vision will offer, but with the courage and foolishness of a New Moon, I am ready for the adventure. Sunday, December 1. This is the last day of the Scorpio lunar cycle. Give thanks for the journey through the shadows. Who did you meet? Who are your allies? The dark of the Moon reveals to our hearts alone the true value of our experiences of the last four weeks, which may have felt like much longer in terms of soul growth. As the Moon contacts Mercury today, find a way to express, even if only to yourself, what is in your heart. Jupiter, Venus, and Mars are supportive. We feel optimistic, connected to others, and able to integrate mind and body to create wholeness. Notice these fleeting experiences and anchor them in memory. It is always good to recharge the batteries when things are going our way. December 2—New Moon: Dreaming. See this week’s forecast intro for more context about the lunar cycle that begins today. In the shifting pulsations of the zodiacal wheel, every water sign is followed by a fire sign. Water signs encourage interior experiences centered around emotion. Fire signs encourage expansion out into the world with a general mission to know who we are and how to express that self-knowledge in a new way. This shift from water to fire can feel big. Perhaps you are noticing that right now. Tap into a desire to know more about yourself. What are you noticing that feels like old patterns of response? What are you noticing that feels brand new? All of this is illuminating. The transits at the beginning of this lunar cycle are less stressful than what is to come near the end of the cycle. Breathe into the flow that is supportive right now and make room in your plans to take care of yourself this month. Flow is happening in both fire and water signs. On the side of fire: We are feeling optimistic and expansive about change with a trine between the Sun/Moon in Sagittarius and Uranus in Aries. In the realm of water: the trine between Jupiter in Cancer and Saturn in Scorpio encourages productive emotional response. Notice how boundaries and compassion work together to bring the right amount of caring for others and self. Not everything is easy, however. Challenges arise around balancing the impulses of expansion and accountability. The opposition between Jupiter and Venus has us look at patterns around money and relationship. The goal is balance. A square between the Sun/Moon and Chiron reveals feelings of vulnerability. As we quest to know ourselves better this month, vulnerability can be a guide rather than a weakness. Self-love is the gift we may gain. Tuesday, December 3. This is a day to express yourself! Communication has the green light. We are both empathic and pragmatic about getting our messages across. But there’s another side to getting things off your chest—the fallout could manifest as conflict. They say that there are healthy ways to be in conflict. I’m still learning that skill, but today may be a great day to practice expression and resolution even when it feels uncomfortable. Wednesday, December 4. I hope you learned something about healthy conflict yesterday because today’s transit could provoke a little more of it. Once a week, the Moon triggers the ongoing square aspect between Uranus and Pluto. Today is that day. In Capricorn, the Moon is asking us cut the drama and be accountable. We may not know what that means, but we all can feel it. Perhaps it appears as a renewed desire to get something real done with your time, or a desire to be acknowledged for your hard-earned talents and skills. Perhaps it also manifests as a tendency to judge. I’ve found that the source of my own judgments is usually a projection of how hard I am being on myself. As we dedicate to self-discovery this month, what are you noticing? December 5—Crescent Moon: Beginning. For all the lofty ideals we can assign to the Sagittarian quest for truth, it must never be assumed that this adventure is motivated by anything less than having the most fun we can. Emma Goldman, who is sourced with saying, “If I can’t dance, I don’t want to be part of your revolution,” had Saturn in Sagittarius. She had to master the art of fun and social change. We can all take a cue from her in this lunar cycle. The contrast we notice today is between the serious goals of a Capricorn Moon and the fun goals of a Sagittarius Sun. I like to think it isn’t an either/or situation. How will you make your revolution fun? Here is a challenge for you: How can you conserve your resources, whatever they are from social capital to money in the bank, while at the same time not being too miserly with them. We need to expand today. It is good to exercise those muscles. Friday, December 6. Today, Sagittarian optimism really kicks into gear. It feels good, rather than threatening, to push the edges. We learn, we connect with others, and we are inventive about it too. In addition to these quick and fascinating encounters, there is strong possibility that we will traverse the terrain of spiritual longing as well. This longing could look like escaping into your favorite fantasy story, writing poetry, or reaching transcendental states. The way there may be diverse, but the place we are going is all about losing oneself in a bigger story. Saturday, December 7. Mars leaves Virgo and enters Libra today. Mars spent about eight weeks in Virgo (a normal time for Mars to transit through a sign). Mars will remain in Libra for about 33 weeks. The difference in length is that Mars will be turning retrograde in Libra in March, thus expanding its time in this sign. Every two years, Mars takes this retrograde journey. (Last time this happened in 2011 – 2012 the sign was Virgo.) The match up between Mars—the warrior planet of desire—and Libra—the sign ruled by gracious Venus—is not quite comfortable. This doesn’t mean we won’t learn a lot concerning these authentic desires: to be true to oneself and to be dedicated to collaborative partnerships. A lot of give and take is in store for us. Later this month, Mars will provoke the Uranus/Pluto square and we will notice all these contrary desires. For now, Mars asks us to mellow out just a little, listen just a little bit more, and find a way to be gracious as we quest for greater self-knowledge. The week of Thanksgiving (in the U.S.) has always felt to me like a jolt to the system. After a soulful month of opening to the unseen world of the dark, the manic holiday season kicks into hyperdrive, trying its best to undo all the deep revelations we just experienced. Practices of mindfulness and intention help here a lot. Even though this pulsation between dark and light is natural, the way we often make this transition at this time of year seems more destructive to our well being than it has to be. The dark season of Scorpio* is followed by the expansive season of Sagittarius—there is a lot to discover and understand about the world of the living after we’ve had a journey with the dead—however, surely there is a more graceful way to do it than fighting over sale items in a discount store. With intention we can reclaim a meaningful way to return to the light of a new season after the dark of the preceding one. Our current transition into Sagittarius’ light happens under a waning Moon. It is important to factor this in when thinking about our own mindful transitions. It isn’t as if being expansive and social are bad things. They aren’t at all. Some of us will dive into those experiences gratefully. Others, need a buffer between the experiences of the last few weeks and the time ahead. Pay attention to what you need. The waning Moon is generally a time of reflecting on what we’ve experienced during the waxing phases. We long for meaning. At the beginning of the lunar cycle, we noticed the veils between the seen and unseen worlds thinning. With the extra impetus of a solar eclipse and Mercury transiting retrograde through Scorpio, we’ve had a chance to go deeper than we might have ordinarily. Even when we can’t put into words what the experience has meant, it is good to acknowledge that something has changed us. We’ve been touched by Mystery. There will be times this week when the interior experience will be pronounced. And the opposite is true too. Thanksgiving itself could be a time of illumination and release. The week ends with the Moon returning to Scorpio for the final days of the cycle—a perfect time to turn off external demands and be quiet, even if for just a moment. Sunday, November 24. There’s a wild card element to the day. The Moon in Leo suggests we enjoy taking more risks today. At any rate, we feel like shaking things up a bit, just to see what happens. The Moon is void-of-course most of the day adding to a sense that we could get away with something that ordinarily we might not. Add to this a square between the Sun and Neptune and it could be that our judgment is just a little off. The dream leads us away. This could be an enchanting day. Find a little bit of magic for yourself. November 25—Last Quarter Moon: Evaluating. Did you wake up with a hangover (figuratively or literally) from yesterday’s fun? Don’t worry; the Moon in Virgo will help you put things back in order. However, don’t be too quick to sweep away the odd pieces that don’t seem to fit together. We have the opportunity to open and respond today in a way that brings resolution to a question or problem we’ve held for the last few weeks—since October 8th to be exact. That was the first time Mercury conjoined Saturn in Scorpio. Due to retrograde motion, the second time Mercury and Saturn came together was October 29. Today, the third pass brings an end to this particular journey through our shadows. In the Last Quarter phase of the Moon, we put the pieces together to give meaning to the whole. What is your meaning? Saturn encourages us to get serious. The work has been in communicating, opening to the past, feeling vulnerable about the future, and hopefully reaching a place of knowing ourselves better. The opposition between the Moon in orderly Virgo and Neptune in dreamy Pisces adds another element of whimsy that could actually be hiding something much more profound. Tuesday, November 26. If something’s been telling you to wait till today to put your Thanksgiving plans together, go shopping, clean the house, make those lists, then you were right. This is the day for that. But rather than feeling like drudgery, all those things contribute to a sense of accomplishment and satisfaction. Just remember—it isn’t about perfection! While you are being productive, give some thought to the meaning of the Thanksgiving season for you. What are you grateful for? How can you give back? What is important about family and home to you? These questions build over the next few days. These reflections help us shift from the dark time of reflection to the bright time of socializing and connecting in the holiday season. Wednesday, November 27. The predominant influence shifts to Venus in Capricorn today. With the Moon in Venus’ home sign, we become concerned with other people. Who do we want to see? Can our social interactions help our professional goals? How can we bring more charm and grace to a social gathering? Is the workload shared fairly? To make the most of the Thanksgiving break, try to flow with Libran balance through the next couple of days. With Mercury making happy aspects with the two benefics, Venus and Jupiter, conversation is lively and possibly very rewarding on many levels. Thursday, November 28. Thanksgiving is a really a hearth holiday. Abundance and gratitude are the blessings we honor. Jupiter and Venus are opposed each other influencing our perceptions of the hearth. Jupiter in Cancer asks us to reflect on what beliefs, dreams, and values infuse our hearths with possibility. Venus in Capricorn encourages us to pay attention to our non-negotiables in order to ensure lasting abundance. These two benefics, even in an opposition, can have a good effect on each other. They encourage balance and integration, a give and take between self-interest and helping others. Watch out for extreme positions; cultivate the middle ground. Even though the Libra Moon influences us to play nice with others, the tense aspects between the Moon, Uranus and Pluto may bring out passive-aggressive behavior even in the best of us. Don’t play games. Stick with what your heart feels. November 29—Balsamic Moon: Surrendering. The best way to align with today’s celestial seasonings may be to stay away from the malls and decide to “Buy Nothing”. Your soul will thank you. This phase of the Moon craves the quiet spaces where we are able to honor our journeys and release them back to the dark. Since this lunar cycle has been about embracing the dark, the best way to complete this work is by noticing the distractions around us and returning to the present. What is really valuable? In this time of gratitude, the timeless and valuable parts of our lives, which create connection and meaning can be to be recognized and honored. The dark journey gives us a special gift. What are you taking away? The Moon moves into aspect with the opposition of Jupiter and Venus that was exact yesterday. Choices may seem black and white. What if you adopted the attitude of Yes/And instead, and entertained all possibilities? The Sufi poet, Rumi, described this state of mind as “a field, out beyond the ideas of right doing and wrong doing.” Step into that field. Saturday, November 30. Astrologer Caroline Casey works with the energy/metaphor of the Compassionate Trickster. On her website she describes her Trickster dedication this way: “cultivating eloquence, mythological literacy, metaphoric agility, the arts of blessing and storytelling—so that we be responsive agents of Trickster Redeemer cool, in a hot, reactive world.” What a great day to embrace the trickster and the compassionate parts of ourselves. The Sun is trine Uranus, encouraging change. The Moon is trine Neptune encouraging empathy. And the Sun is square to Chiron reminding us that everyone of us carries a transformative vulnerability that opens us to wisdom. Imagine this guiding your day.